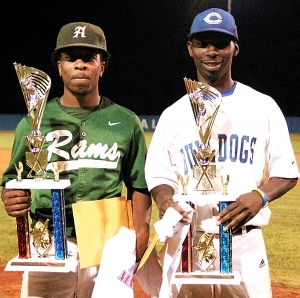 2018 Senior All-Star Baseball Classic MVPs – (l-r) Arabia Mountain’s Corey King (East) and Chamblee’s Norman Kelly (West). Chamblee’s Norman Kelly completed the West Seniors come-back victory with his game-winning, sacrifice fly with the bases loaded in the bottom of the ninth to give his team a 12-11 victory over the East at Stephenson High School on Tuesday night. The East scored three runs in the second, third and fifth innings to build the 9-1 advantage. Arabia Mountain’s Corey King had two RBI singles to go with RBI singles from Joshua Campbell (Arabia), Dequarious Rencher (M.L. King Jr.), Lyndon Weaver (Redan) and Jerrod Bibb of Lithonia had a sacrifice fly and a RBI single in the early scoring barrage. Trailing 9-1 heading to the bottom of the fifth, the West struck for six runs to pull within 9-7. Kelly, who had four RBI in the game, had a two-run double and Columbia’s Elijah Hammonds added a two-run single. Kelly would steal home for another run and Columbia’s Tramaine Callaway drew a bases-loaded walk to push another run across. Errors in the top of the sixth by the West led to a pair of runs for the East and an 11-7 advantage as the West opportunities dropped to 12 outs. Chamblee’s David Albuquerque scored on a wild pitch and Hammonds drove in Druid Hills’ Thomas Weingartner to trim the East lead to two (11-9). Decatur’s Jonathan Paden had an RBI single and Norman Kelly’s hard shot to third scored Paden to knot the game at 11 heading into the eighth inning. Both teams went down in order in the eighth and headed to the ninth all tied at 11-11. Martin Luther King Jr.’s Xavier Wilson singled to left and Weaver laid down a perfect bunt for a hit to put runners at first and second with nobody out. Hammonds looked to be in trouble on the mound with the go-ahead run in scoring position and Corey King coming to the plate. Hammond induced a double-play grounder to shortstop Weingartner who threw to second baseman Paden and on to Mason Curtis at first to put two outs on the board. Wilson had advanced to the third on the play and was just 90 feet from tying the game when Hammonds induced another grounder to Weingartner who made another nice play for the third out on his throw to first from deep at short. The West came to bat in the bottom of the ninth against Joshua Campbell and drew three consecutive walks to load the bases for the hot bat of Kelly. Kelly answered the bell again lofted a deep fly ball to left to score Curtis with the winning run. Kelly won the West MVP award finishing 2-4 with 2 doubles, 4 RBI, 3 stolen bases and the game-winning sacrifice fly. He tied four others with two doubles, tied Redan’s James Parris (2017) for most RBI (4) and tied Jamari Johnson of Columbia (2016) with most stolen bases (3). Columbia’s Tramaine Callaway and Chamblee’s David Albuquerque tied two others for most walks drawn in a game with 3 each. 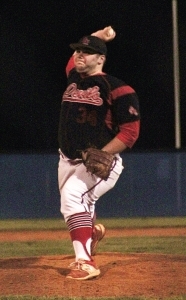 Druid Hills’ pitcher Mason Curtis set a new Senior All-Star pitching record with 9 strikeouts breaking the record of 8 held by Joe Billick (Dunwoody, 2003), Kenneth Camp (SW DeKalb, 2003) and Tim Jones (Redan, 2007). Arabia Mountain’s Corey King allowed no hits or runs in his three innings on the mound to start the game while striking out 7 (tied for third) while going 2-5 at the plate with 2 RBI. The West now leads the series 4-2.